3: Return Drownyard Temple from your graveyard to the battlefield, tapped. This card is really unique, as there are plenty of graveyard strategies in Vintage/Legacy. Dredge is one that specifically comes to mind, but the 3 mana cost to activate is probably a hinderance. It's probably not good, but I feel it deserves to be thrown out into the forums to see if anyone comes up with any good interactions. If it went to your hand it would be a bad squee. Since it goes to battlefield, it can trigger landfall. However you will need some mechanism to sacrifice the land and repeat the process. It "works" with zuran orb, although you will need infinite mana to go infinite. Unless there is some combo, it's an unplayable card in Vintage. Providing you have 3 mana to return it, you don't really need this. And it's unlikely that this card is in the graveyard against mana denial strategies: if I'm going to waste something, it's not this. This is the exact reason why I threw it out in the threads. I hadn't thought about this, and it's certainly interesting. You are right though, you would need a lot more. With infinite mana it functions like fastbond, zuran orb, crucible in a list like salvagers without needing a restricted piece. The thing that comes to mind to me would be something like this +lotus cobra x2 and Orb, or squandered resources and this and landfall triggers. I think there are ways to make this a piece of a combo somewhere but likely other, better combo pieces need to come out to make it worth it. Personally I love the thought of a deck that uses 4x courser of kruphix, zuran orbs, lotus cobras and the like being viable in vintage, probably not going to happen though. Comedy gaming podcast. Listening to it makes you cool. I will attempt to play this card. Whether its actually playable remains to be answered. Getting extra bloodghast triggers if you have the mana, and the ability to ramp out of the yard seem like fine functions. Getting to 4G for a giant Troll seems pretty easy with this. Works with Smokestack (and isn't made redundant with Crucible). Not sure if that's good enough, but it's something. 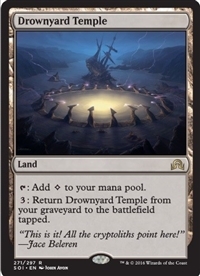 Another point for Landfall: Drownyard Temple allows you to trigger landfall on your opponent's turn without using a fetch land or casting a spell. Pretty minor. In the fight of Crucible vs Drownyard Temple, I think I want Crucible almost every time. Rather than list all the times I'd want Crucible more, I'll stick to when I think Drownyard is better. Instead of tearing things down we should calmly explain our opinions. If we're specifically talking about Smokestack, Crucible gives you +1 permanent a turn, but uses your land drop, so if you have a handful of lands crucible doesn't really do anything, and a second Crucible never does. Drownyard Temple gives you +1 permanent whether or not you use a land drop, and with multiple Drownyards you could support a Smokestack at 2 without ever losing it, which Crucible doesn't let you do. That costs 6 mana, though, which is non-trivial. I don't think that interaction makes Drownyard significantly better or anything. Team GGs: "Be careful what you flash barato, sooner or later we'll bannano"
"Demonic Tutor: it takes you to the Strip Mine Cow." In a fight of Crucible vs Crucible, which is not uncommon for a Shops mirror, this does give you a way of getting ahead in lands/permanents.